Line Markings are necessary for most indoor sports halls and consideration should be given to the methods which can be used. In general, two types of markings are available: Painted Lines and Self-adhesive tapes. The method that is most appropriate will depend on several factors – a non-exhaustive list may include: Type of floor surface (i.e. timber or PU), Permanent or temporary lines, life expectancy, facility use/activity and maintenance. Reflex has an experienced Line Marking team that can provide lines on new or refurbished floors. We are very knowledgeable on current Sport England Guidelines and can help with any line marking requirements. Our technical team has pioneered the “REFLEX TEMP TAPE” which features a special low tac adhesive for temporary markings that leaves no residue or damages the surface underneath. Please click on the button below for further information. In conjunction with our partners at PULASTIC we are developing LED inlaid lines which could revolutionise the way lines are marked out in sports facilities. Although not available in the UK yet……. we are very hopeful that we will be able to introduce this state of the art technology in the very near future. Further information will be available after our trial floors in mainland Europe are evaluated. 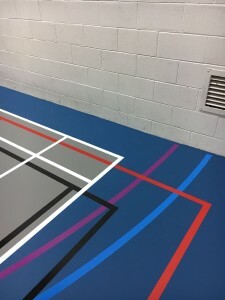 Why not customise your floor with your corporate or sporting identity. Our beautiful logos can make your facility unique.